This and every Sunday, enjoy the Bajan Buffet Lunch on The Deck in the Coconut Court Beach Hotel! See attached flyers for full menu. Entertainment by DJ Mathew from 1 pm. Children 4-12 y.o. half price. You can also just sit at the bar, buy a drink, and enjoy the music. 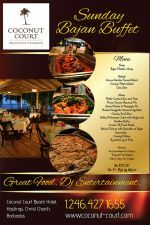 The Coconut Court is a family run 3-star hotel with fine beach facilities and an active turtle-watch program at the western end of the South Coast hotel strip offering Caribbean and International cuisine.